Get the extra firm support you need with this Beautyrest Pima Cotton Pillow. Filled with hypoallergenic for extra comfort, this pillow is perfect for side sleepers, with a 2” gusset for additional head and neck support so you enjoy a great night’s sleep, every night. Pima is one of, if not the best, grades of cotton in the world. The Beautyrest Pima Cotton Pillow King Size (4 Pack) has many exciting features for users of all types. See the Beautyrest Pima Cotton Pillow King Size (4 Pack) gallery images above for more product views. 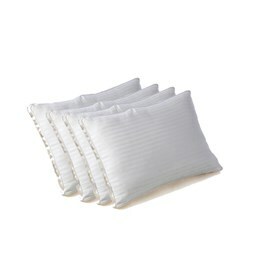 The Beautyrest Pima Cotton Pillow King Size (4 Pack) is sold as a Brand New Unopened Item.